[ #OctaneRender ]Cloud graphics company, OTOY Inc., today delivered its largest update ever across its entire product line with the announcement of OctaneRender 3, OctaneVR, OctaneRender Cloud services, and the open source ORBX media file format for HTML5, VR and AR platforms designed to provide artists with the most versatile suite of rendering technologies possible. OctaneRender 3 transforms the world’s best production-ready GPU renderer into a state-of-the-art VFX juggernaut that incorporates a wide range of emerging industry standards for GPU rendering, including Open Shader Language (OpenSL) and OpenVDB for particle simulation, while introducing features never before seen in any production renderer, including volumetric light field primitives and procedural microfacet displacement primitives. 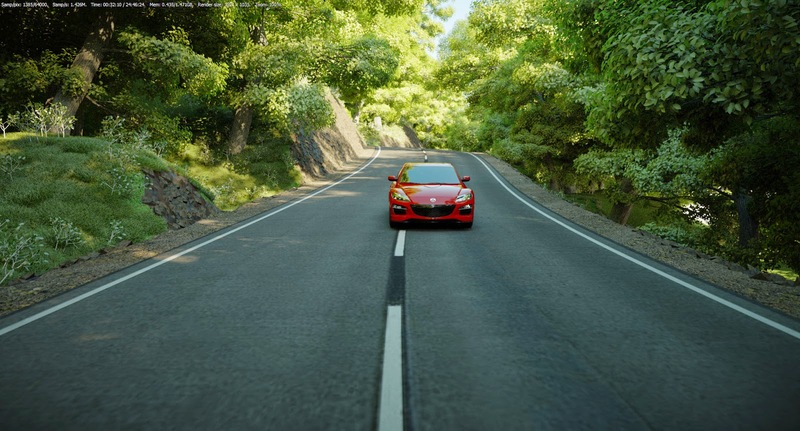 OctaneRender 3 also supports a live and offline baking tool chain for game engines such as Unreal Engine 4 and Unity, and supports ‘one-click’ artist-driven publishing of simple, navigable baked scenes, and full cinematic content authoring for HTML5, VR and AR, using scripting nodes directly from apps such as 3DS Max, Maya and Adobe Photoshop. Volumetric rendering: OctaneRender 3 supports the ability to render particulate matter such as clouds, smoke, fog, and fire with varying densities and introduces a unique native primitive type for incredibly detailed micro-surface displacement volumes and surfaces required to render photorealistic natural and organic materials. Dreamworks’ OpenVDB is also supported for direct in-camera rendering of particle simulations. Open Shader Language (OpenSL) support: Through OpenSL, content creators have the ability to build their own materials, procedural textures, and shaders, taking advantage of what is quickly becoming an industry standard while maintaining the exceptional performance OctaneRender is known for. Deep pixel rendering: OctaneRender 3 adds deep pixel rendering support, as well as live connecting of DCC and compositing apps through Octane plug-ins for Pixologic’s Zbrush and The Foundry’s NUKE. OctaneRender 3 will also ship with a built in plugin for Adobe Photoshop that will properly handle multi-layer EXR files and support live deep pixel layer composting within Photoshop. Artists can open, create, and save ORBX media files introduced in OctaneRender 3, including planar and volumetric light fields, directly within Adobe Photoshop. Advanced live texture baking: A feature that’s most beneficial for use in real-time game engines, OctaneRender 3 supports unbiased GPU texture baking (UV or volumetric) of global illumination, spherical harmonics and 8D light fields in Unreal Engine 4 and Unity plugins. Infinite mesh and polygon sizes: OctaneRender 3 removes all limits on the maximum allowed primitive and triangle count. FBX and PTEX support: OctaneRender 3 supports importing data from Autodesk’s FBX file format and Disney’s PTEX texture file format. Split render passes, advanced per object reflection controls: OctaneRender 3 allows artists to split render passes into raw lighting and albedo passes, and adds fine-grained reflection, shadow and illumination casting controls per object or layer. These elements can also be built into the export, whether it is a light field, VR scene, or a movie file. Fully configurable: OctaneRender 3 allows fully configurable UI, transform gizmos and dockable windows. New plugin APIs: While previous versions of OctaneRender have support LUA plugins through scripting nodes, OctaneRender 3 adds C plugins and portable LLVM-based API support in ORBX packages. OTOY will be inviting select users to participate in the alpha release of OctaneRender 3 this summer, with a full release slated for the second half of this year. First-of-its-kind container: The ORBX media format is the first of its kind, containing pre-rendered data in the form of light field render target caching for VR, AR and portal materials, supporting movie and audio textures such as MP4 or HEVC for use natively inside of OctaneRender as a texture or a procedural, and storing node timelines. Fully navigable: ORBX media files support web and mobile viewing of interactive content and texture baking directly from an Octane scene node, without the need or mastery of real-time game engines. Artists can bake their 3D scene for mobile, TV, VR, AR (light fields) and HTML5 playback. Versatile rendering: The ORBX media format stores spectral film buffers allowing artists to pause and resume renders from disk. ORBX Media Viewer: The first app that will support the ORBX media format will be the ORBX Media Viewer. The ORBX Media Player is already used for enjoying studio VR experiences such as the upcoming Batman: The Animated Series project OTOY is building with Warner Bros., or live streamed VR events like the hockey game OTOY recently produced in cooperation with the NHL. The ORBX Media Player will work with the Samsung GALAXY Gear VR, as well as Android-powered phones, tablets, and set-top boxes, with support for Microsoft HoloLens and HTML5 WebVR to come after launch. Feature parity with OctaneRender 3: OctaneRender Cloud is built on the same codebase as OctaneRender 3. Create from anywhere: Using desktop.otoy.com artists can enjoy live authoring and content creation in OctaneRender in any HTML5 browser. Cloud-fueled rendering: orc.otoy.com will support unlimited, batched offline rendering jobs from ORBX scenes to produce images, animations, light fields, simple baked navigable ORBX media for ArchVis walkthroughs and asset browsing, full interactive scene export, packaging and deployment for VR and AR, all powered by Amazon Web Services, or OTOY’s own GPU clusters. Advanced content distribution: OctaneRender Cloud will support watermarking and pay wall authentication for web-based commercial content distribution and protection of IP of media created in OctaneRender. X.IO app integration: Applications that are built on OTOY’s X.IO App Streaming service will be connected to OctaneRender Cloud. OTOY’s real-time raytracing engine, Brigade, will be one of the first services leveraging the full scope of ORBX media exporting from OctaneRender, allowing artists to navigate scenes dynamically with no noise, and streamed to any device. OTOY will invite select users to participate in the OctaneRender Cloud beta release this spring with an expansion of the program over the summer. Previously announced OctaneRender plugins for The Foundry’s NUKE, Side Effects Software’s Houdini and Autodesk’s MotionBuilder are currently in broad public betas and are set to be released shortly. Plugins for Adobe After Effects and Adobe Photoshop will follow shortly afterward, followed by a plugin for Pixologic’s Zbrush.